365 of Me: 303/63 Happy Halloween! Happy Halloween! 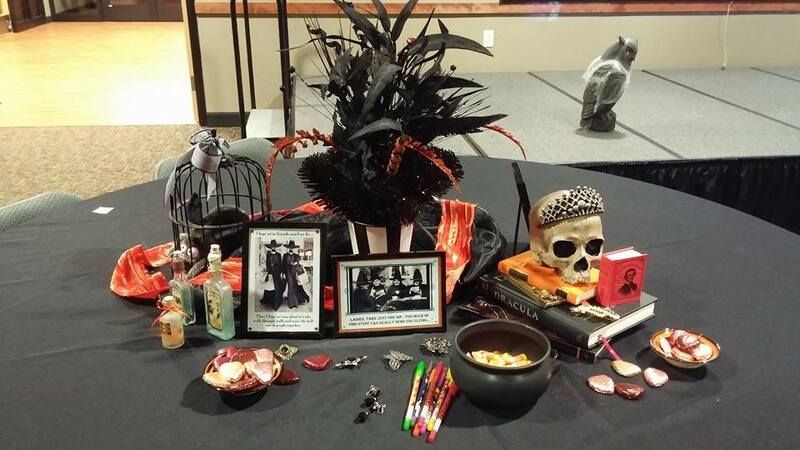 Last night at the library event, some attendees who had reserved tables chose to decorate with fun settings for their guests. This one was my favorite. Check out the tiny volume of Poe stories on the right. Overall, it was a fun event and a great way to wrap up the week of events I’ve had as an author. Last night, I briefly discussed Halloweens of Old with a few other participating authors. We talked about our favorite costumes as kids and the fun traditions we had, what we looked forward to every year. It saddened me to think how scared we are these days and how more dangerous the world is these days which requires us to be scared of it. I hate that kids miss out on the fun things we did back then, but hopefully there are new fun traditions being made tonight that they will remember one day. So we turn the calendars tomorrow. Some of you may have done so already. And don’t forget to turn your clocks back this weekend as well. Times are changing. Another year almost over. Previous 365 of Me: 302/64 Last night for ghost stories!